Don’t miss out on the opportunity to live in this one-of-a-kind community. El Norte Park offers incredible new homes in Escondido featuring spacious lots and an attractive location with shopping, recreation, and convenient freeway access. Models are now open, so tour these beautiful new homes today! Single and two-story luxury floor plans are available ranging from 2,784 to 2,950 square feet with up to 5 bedrooms, 3 bathrooms and 3-car garages. Each home is on a minimum 10,000 square foot lot with fencing, and front and back landscaping! If you buy now, you may still be able to personalize your new home. Prices start in the low $700,000’s, and remember there are no HOA or Mello-Roos! The eleven luxury homes at El Norte Park are the epitome of quality and appeal. Inviting, gourmet kitchens with breakfast nooks are perfect for entertaining guests and feature slab-granite countertops, GE Profile stainless steel appliances, two-compartment sinks, generous pantry space and under cabinet lighting. Bathrooms include slab-travertine countertops and backsplashes, spacious soaking tubs, 12”x12” Porcelain tile, glass-enclosed shower stalls in master baths and Porcelain-over-steel tubs in secondary baths. In addition, there are mirrored closets, master bedroom walk-in closets, two-toned interior paint, 18” x 18” Porcelain tile floor and more! Michael Crews has been building North San Diego County real estate for more than 27 years. Current neighborhoods include Center Stage, Royal View, Gretna Green, Cityscape and El Norte Park in Escondido, Sunset Heights in Vista, and Match Play at La Costa in Carlsbad. Stop by or call the Sales Office today for more information. Buying a new home is one of the largest investments you will ever make, so why settle for something less than perfect? Michael Crews Development homes are priced for quality and value. Pricing starts at just $539,900 at the Cityscape neighborhood in Escondido, and runs to the mid-millions at the gated Royal View community in Escondido’s beautiful San Pasqual Valley. Homes range from 2,071 square feet to 4,164 square feet with 4 to 5 bedrooms, 4.5 baths and up to 6-car garages. Michael Crews has been building quality North San Diego real estate for more than 27 years. Current neighborhoods include Center Stage, Royal View, Gretna Green, Cityscape and El Norte Park in Escondido, Sunset Heights in Vista, and Match Play at La Costa in Carlsbad. Stop by or call the Sales Office today for more information. Sales Offices are open daily at Cityscape in Escondido from 9 a.m. to 6 p.m. Offices are also open from 10 a.m. to 5 p.m. at Center Stage, Gretna Green and El Norte Park in Escondido, and Sunset Heights in Vista. Royal View and Match Play are available to tour by appointment. To get to El Norte Park, from I-15, exit on El Norte Parkway and head east approximately 3 miles. The El Norte Park neighborhood is on the left side of El Norte Pkwy at the intersection of Midway Dr. Call the Sales Office at 760-751-1212 for more information. 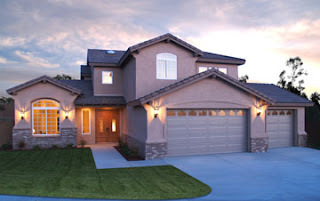 You may also visit us online at www.michaelcrews.com to tour new homes and sign up for our weekly e-newsletter. Gretna Green is a perfect example of what Michael Crews Development has to offer. These beautiful two-story new Escondido homes for sale feature 2,885 to 3,704 square feet, 5 bedrooms, 3 baths and 4-car garages on large lots ranging from 20,000 to 30,000 square feet.Located off Bear Valley Parkway, this quaint enclave of prime Escondido real estate has convenient access to Interstate 15 and North County Fair Mall. In addition, Gretna Green is zoned for some of Escondido’s best schools. Another real estate opportunity is the popular Cityscape neighborhood located off Midway Drive and Grand Avenue in Escondido. Cityscape features 14 spacious new row-homes, each with 2,071 square feet, 4 bedrooms (optional den), 2.5 bathrooms and parking for 5 cars. It’s an incredible value at just $539,900. Many buyers are finding benefit in Michael Crews Development’s Trade Up Program. This program allows buyers to trade in their current home for a new Michael Crews Development home. It’s available at several Michael Crews Development neighborhoods and Escondido homes for sale including El Norte Parkway, Royal View, Gretna Green and Center Stage. Michael Crews has been building quality real estate in North San Diego County for more than 27 years. He is North County’s local homebuilder, and he guarantees the quality of his homes. Stop by or call the Sales Office today for more information on current neighborhoods and upcoming projects. Sales Offices are open daily at Cityscape in Escondido from 9 a.m. to 6 p.m. Offices are also open from 10 a.m. to 5 p.m. at Center Stage and Gretna Green in Escondido, and Sunset Heights in Vista. Royal View, El Norte Park, and Match Play are available to tour by appointment. Call the Sales Office at 760-751-1212 for more information. You may also visit us online at http://www.michaelcrews.com/ to tour our new homes and sign up for our weekly e-newsletter.